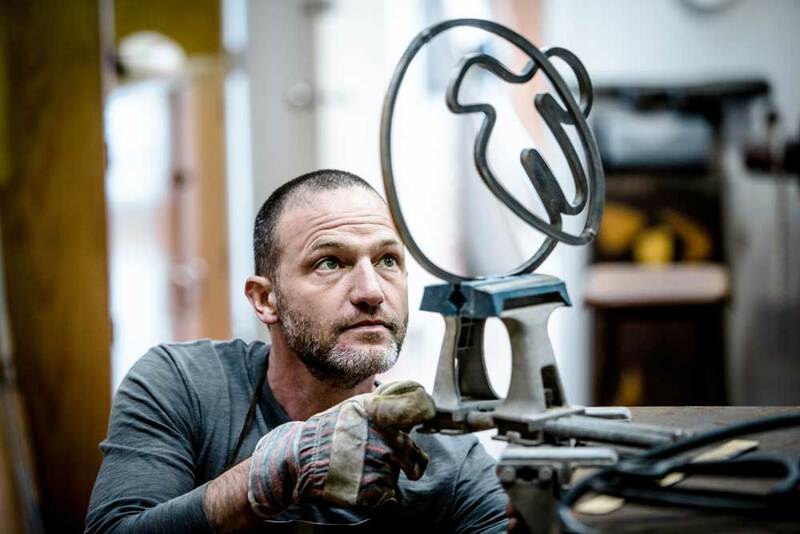 ARTIST GIDON BING HAS TRAVELLED MANY ROADS TO GET TO THIS PLACE – along the highways of corporate mergers and acquisitions, to the winding back streets of furniture making and design, to the dirt and gravel of archaeology, and enlightened paths of religious history and anthropology. His journey began early thanks to his parents and grandparents who surrounded him with art history, traditional crafts, diverse cultural interests and exposure and, in particular, architecture (his grandfather was Czech architect Henry Kulka, a student and then partner of Czech Avant Garde architect, Adolf Loos). 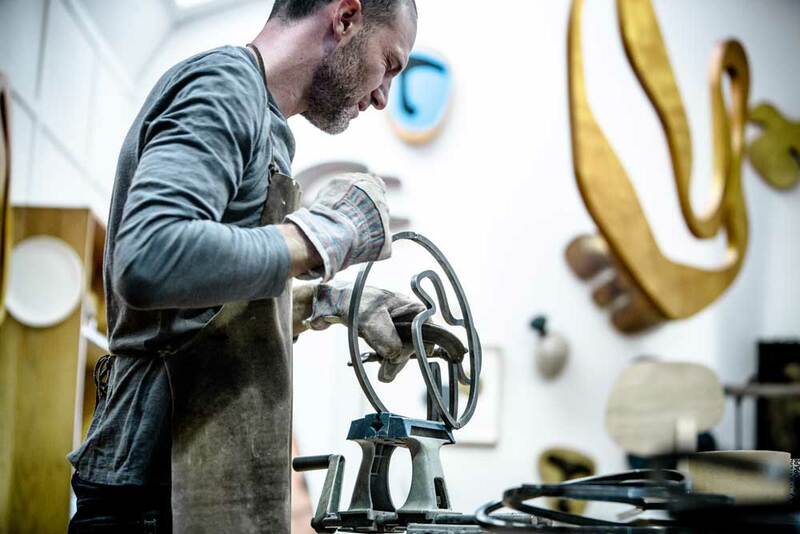 Since then, Gidon has forged his own route, gathering skills imparted by European master craftspeople, a reverence for tradition, a love and respect of materiality, a Modernist aesthetic and continued interest in Pacific and Oceanic aesthetics surrounding his native New Zealand. 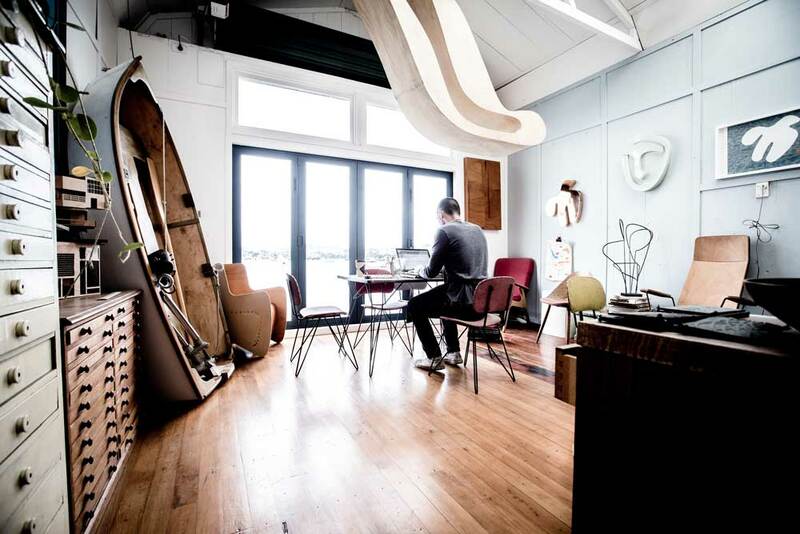 Here the artist speaks to us from his Auckland studio about what inspires him, while photographer Gareth Cooke captured the artist in his space. I live near the coast in central Auckland with my ceramics/plaster studio in the basement and a second sculpture studio five minutes away in a boatshed. What is your favourite thing to do in your city? Auckland has a bunch of great weekend markets with some of the best produce and some pretty good second hand finds. All sorts of things – from material properties and process, literature, architecture, biology, my wife and children’s drawings. 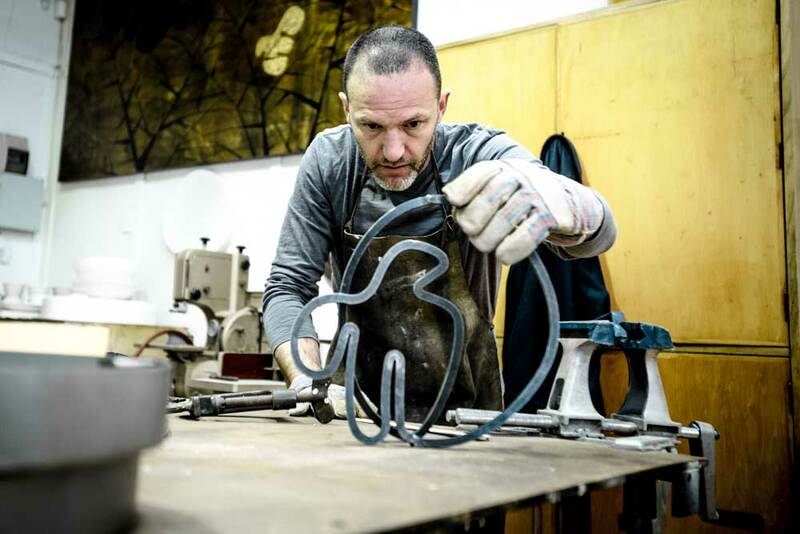 Gidon Bing working on ‘Aegean Bird’ sculpture, available in our gallery store. 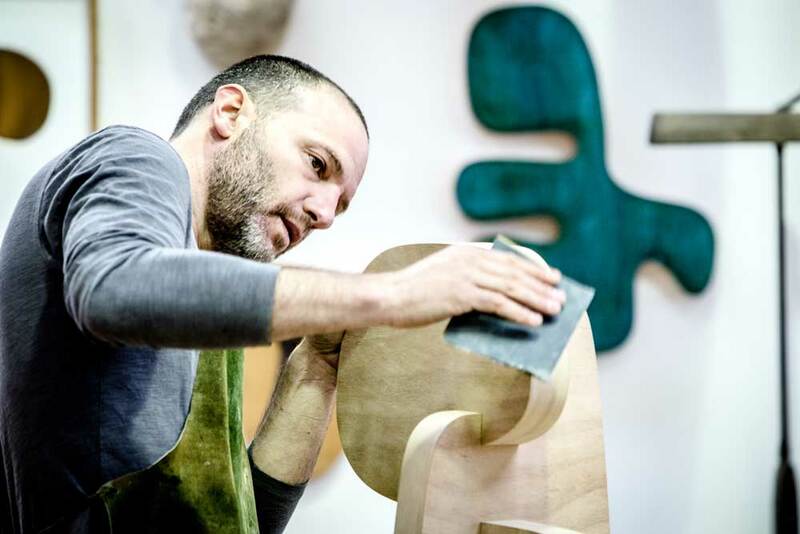 The sculptor working on a plywood study for a large work. 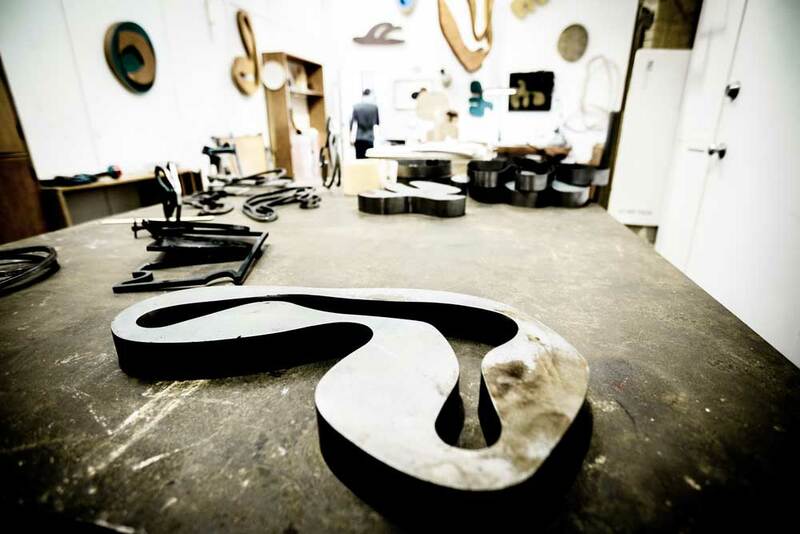 A bronze form in the studio. I don’t really seek it out. Instead, I play with the medium until something is discovered or revealed, which is often the best and most effortless way to arrive at those elusive and serendipitous moments where you produce something unified and simple. Hard materials belie the organic forms they take on. 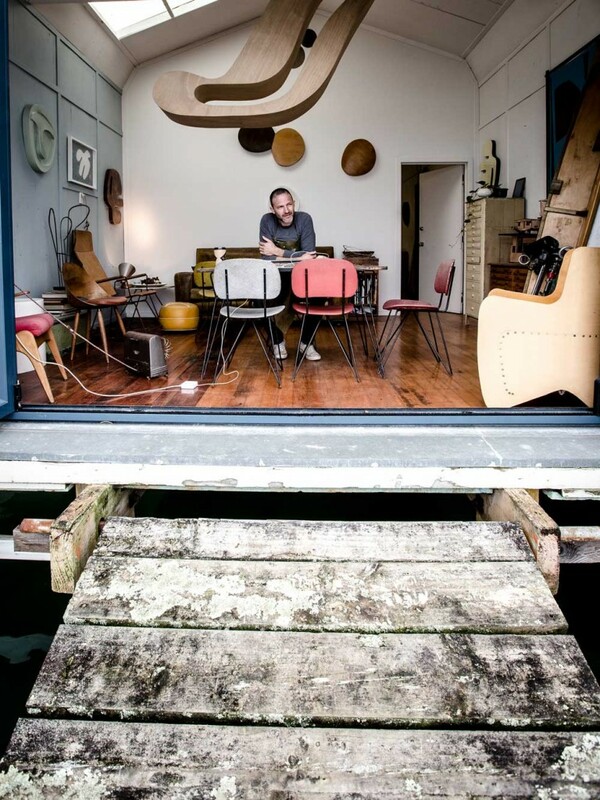 Gidon’s boatshed studio sits on the banks on an Auckland estuary. Looking in from the boat ramp. 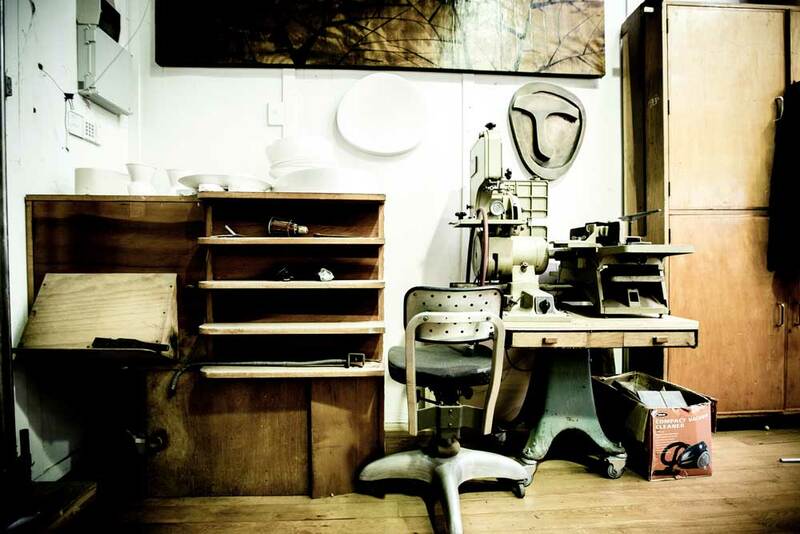 An industriuos corner of Gidon’s studio. 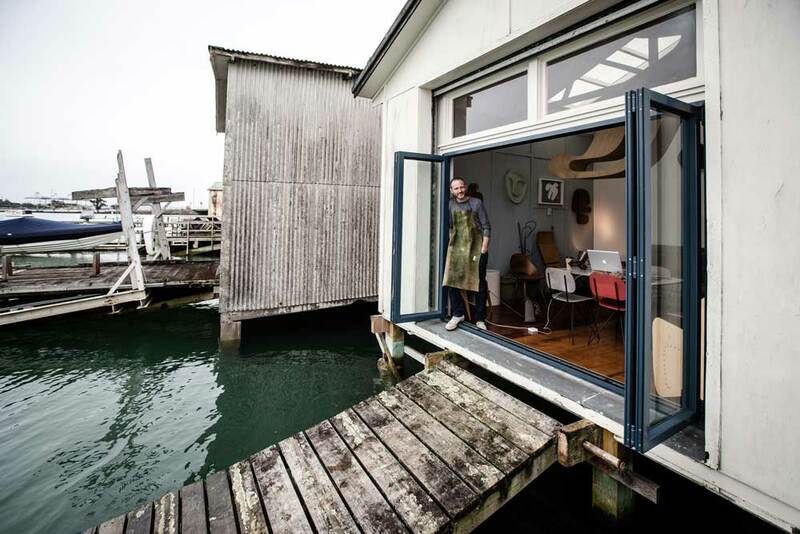 A peaceful respite for the artist, his studio looks out on Aucklands’s natural beauty. 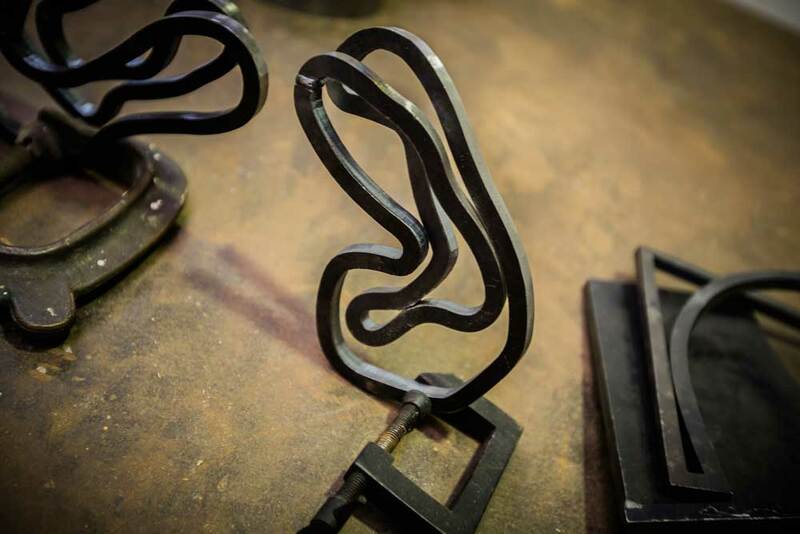 People’s enthusiasm for the means and ends of creativity; the joy of working with fine materials; the knowledge that what I make has a life beyond my studio and the opportunity to collaborate and learn. I’m not sure that its challenges are greatly different from most endeavours. A big challenge for me is containing and limiting the mediums I work with as I tend to become fascinated by a new medium/process/material and are not satisfied until I have achieved some degree of mastery over it. What do you hope people feel/think/see when they see you work? That the objects express an essential simplicity and beauty that appeals to something deeper than transitory aesthetics. I’m not sure I ever consciously wanted to be an artist, but I have always found great pleasure in the compulsion to create. 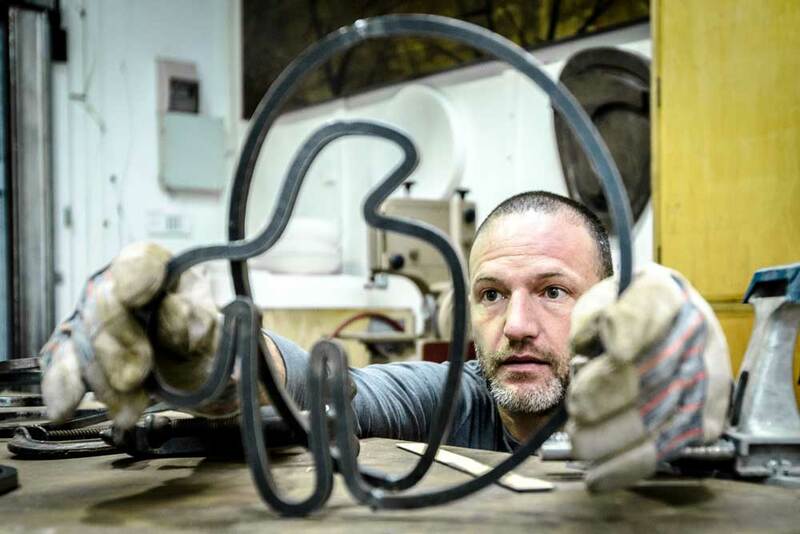 Gidon as work on ‘Agean Bird’ available in our online gallery. I tend to become fascinated by a new medium/process/material and are not satisfied until I have achieved some degree of mastery over it. 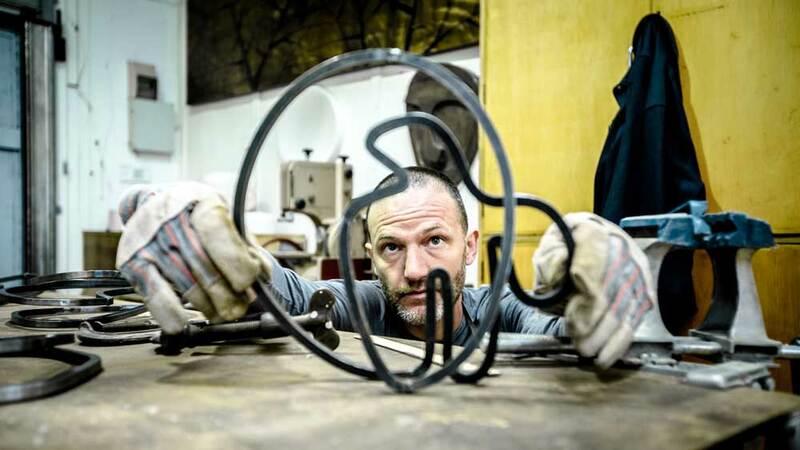 It’s Gidon’s love and respect for materials that enables him to experiment with manipulating them into shapes inspired by architecture, biology and primitivism. This morning I had an epic process failure, liquid plaster everywhere – contaminating my cellulose fiber – out of this came an interesting discovery. I am now conducting a few tests for a new recipe for fast drying moulds. Corporate mergers, acquisitions and investment, landscaping, archaeology, product and furniture design and fabrication. My 5-year-old daughter’s toilet song! Tel Aviv. It has the best climate, best food, best architecture, best bookshops. The boathouse is one of two studios used by Gidon. The other is in the basement of his home, which he inherited from his grandparents. He also inherited their love of architecture and mastercrafts. To seek out and learn from those who have mastery and depth of traditional knowledge. Not sure I’m in a position to be offering advice! But if pressed I’d say maintaining both a reverence for tradition together with a healthy scepticism for expert opinion. Architectural design for a modest mountain house. GIDON BING’S WORK IS AVAILABLE IN THE CURATORIAL+CO. ONLINE GALLERY HERE. 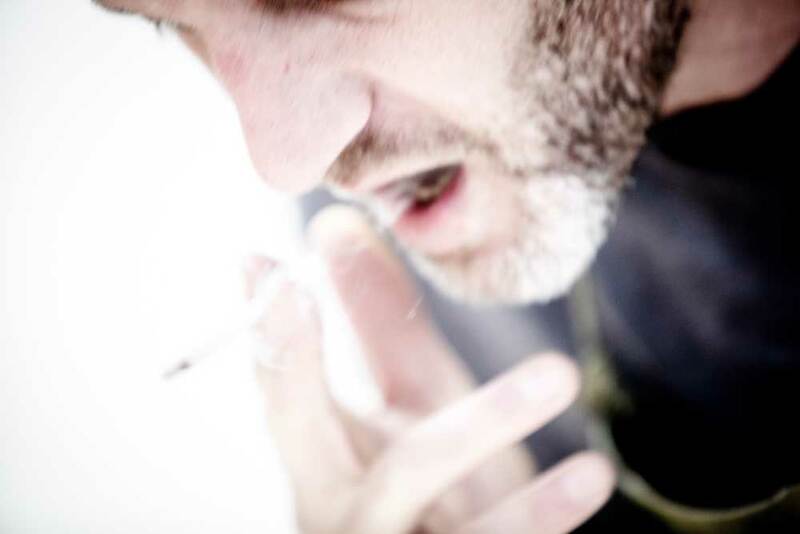 All photography by Gareth Cooke/Subzero Images, commissioned by Curatorial+Co.